this slow cooker thai chicken soup. not only does it sound incredible, but the freaking pictures? gah. this cinnamon sugar donut ice cream. i just… can’t. this creamy polenta with roasted maple sea salt vegetables. maybe (read: definitely) i can do veggies this way. these buttermilk chocolate chip crumb cupcakes. this is so breakfast. these apple cider pancakes. ’tis the season. this sweet potato tahini crostini. GAH. these roasted acorn squash pancakes. serious pancake obsession. this chai pumpkin oatmeal. i don’t even like oatmeal. i want to eat all of this oatmeal. these bicoastal cookies. so cool. these drunken monkey marshmallows. in freaking love. this apple spice crumb cake. big thing with crumbs this week! these sweet potato fries with gravy and cheese. yes. all day. every day. 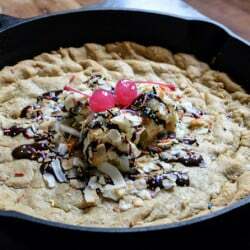 Peanut Butter Skillet Cookie Sundae. That slow cooker thai chicken soup! Genius and delicious. I’m currently loving Scandal/fall TV! Heidi’s soup — yes, yes, YES. And I totally want to make the polenta! Thanks for the link love (again)! Tho sweet potato fries look amazing! Very interested in the Apple Cider Pancakes, tried apple cider waffles a couple times earlier this year & it was a no go each time. Great list. My list has you on it. I can’t stop eating them. I am LOVING those sweet potato fries. Yum! I love your ‘currently crushing on lists- what an awesome list! I pinned the thai chicken soup, that’s definitely on the ‘what to do when furloughed’ list. Thanks! It’s not even 8 a.m. and I want a bowl of that Thai chicken soup right NOW! Check out my Blog where I tried Jamie Olivers Tacos! I think that slow cooker Thai chicken soup is on EVERYONE’S pinterest board right now! I love you. Done and done.